Small Business Saturday—it’s the day after the Black Friday big box store madness. Shop local on Saturday! Claremont Art Studio is opening its doors for a special Small Business Saturday Pop Up Event. We’re inviting the public to come shop local with us at our Pop Up Art and Craft Market from noon to 5pm on Saturday, November 29th. Types of work for sale and on display include paintings, prints, jewelry, bags, hats, knit creatures and creations, and encaustic paintings. Sarah Soward is an oil painter who shows her work internationally and across the United States. 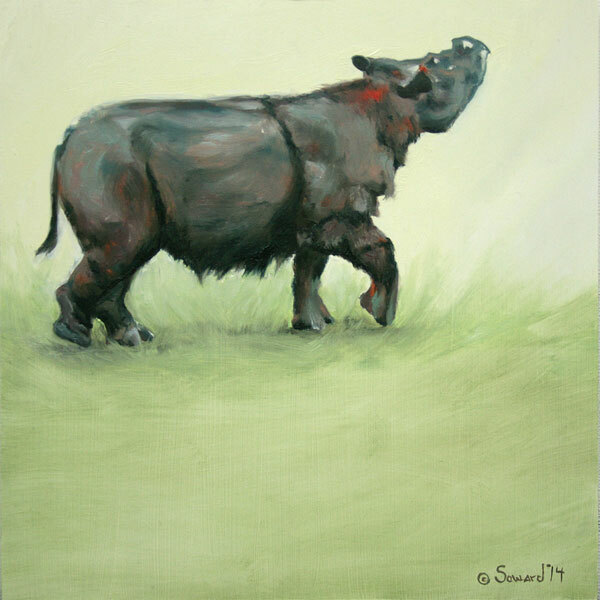 Her work uses primarily endangered animals, such as the rhinoceros, as its subject matter. Soward’s paintings are playful, painterly, and often incorporate surrealism. She will have paintings, prints, and items from her jewelry line available. Mike “BAM” Tyau is a graffiti artist whose work is colorful and energetic. Sionnan Hillier works in a variety of painting and drawing media to create work that speaks to how we see as much as to what we see. Terri Litz crafts lovely bento-style bags and is promising to bring Santa hats to sell as well! Aanraku Glass Studios will be showcasing jewelry and small glass works. Jim Coleman is selling intriguing mixed media sculptures. Maria Fregoso is a realistic painter of luminous botanicals. She will have paintings available. The Yarn Bombers will have fiber arts and knit accessories available. Carol Aaron is an encaustic painter with a range of styles. Her latest works incorporate the Buddha. Melissa Von Bunau‘s work ranges from encaustics to figurative drawings and paintings. This entry was posted on November 9, 2014 by dougbadgoose in Events and tagged art, artists, Claremont Art Studios, community, drawing, jewelry, oil painting, San Mateo CA, Small Business Saturday.